Melaleuca offers Loyalty Shopping Rewards as a reward for being a loyal customer Any customer with a minimum 35 product point commitment may participate. To purchase an item with Loyalty Shopping Rewards, simply place the item in your shopping cart and click the checkbox next to "Purchase with Loyalty Shopping Rewards." The points and price of those items will then be removed from your shopping cart. Remember, you must meet your monthly product point commitment in order to check out with your Loyalty Shopping Reward purchases. Most Melaleuca products can be purchased with Loyalty Shopping Rewards. Loyalty Shopping Rewards are not earned on Backup or Select Pack Orders. When you check out, look for the check box to "Purchase with Loyalty Shopping Rewards". You cannot use Loyalty Shopping Rewards to pay for shipping, handling, or tax on products. 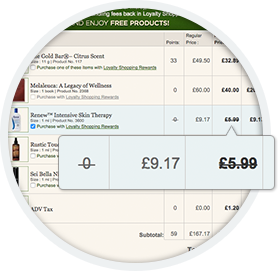 There is a £1 redemption fee when you use Loyalty Shopping Rewards. You must meet your Product Point commitment in order to check out with Loyalty Shopping Rewards purchases. Loyalty Shopping Rewards cannot be used to purchase specials, packs, products without points, discounted items, and sales aids; or to pay for shipping, handling or taxes. Loyalty Shopping Reward redemptions can only occur with a minimum Product Point order and a £1 handling fee, applicable shipping, and taxes will apply. No Product Points will be given for products purchased in whole or in part with Loyalty Shopping Rewards. At the time of cancellation or discontinuation of Preferred Customer status, Preferred Customers will forfeit all Loyalty Shopping Rewards in their account. Melaleuca reserves the right to modify or discontinue the Loyalty Shopping Rewards programme without notice at any time. Earn UK 15% / IE 20% in Loyalty Shopping Rewards by shopping online from the 1st of the month through the 25th. New Preferred Customers will be awarded UK 15% / IE 20% Loyalty Shopping Rewards for any order placed online in their month of enrolment, regardless of the date the order is placed. Sample Reward Calculation: Placing a 71 point order online before the 25th earns you £10.65 Loyalty Shopping Rewards (71 points x 15%).